Photo by The Bird Guide Greg Gillson. 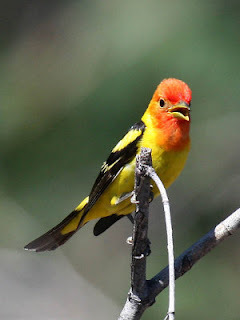 The Western Tanager is another eye-candy bird that I often see in my neck of the woods during the right season. Below is a compilation of eBird maps by month using data from 2000 through 2009. The animated GIF (Thank you Picasion.com) shows how the Western Tanager expands from its winter range into breeding range and then back to winter range. What conclusions can we draw from watching this? Similar to the Bullock's Oriole animation I posted the other day, the Western Tanager expands its range rapidly between April and May. In June the populations appear high, but a little more concentrated, most likely due to breeding. The distribution holds fairly steady from June through August. They seem to really clear out of most of their western range by October. Their prinicple winter grounds appear to be in Mexico. It looks like there are wintering populations in Southern California, and surprisingly along the eastern seaboard of the United States. Also of interest, Western Tanagers are found along the Gulf Coast during all the months, except the summer months. Ebird map is great..I need to explore ebird a bit more..
You're right, a few Western Tanagers do winter on the eastern seaboard. It's a very rare, but regular winter vagrant to North Carolina, for instance. We usually get 2-3 per year every year. @dAwN - thanks for checking in and commenting. Keep up the great work on your birding blog! @Nate - thanks for the confirmation about the Western Tanagers on the east coast in winter. I really enjoy your blog too.